Inspiration! We're all searching for it, right? But creativity has to come from somewhere. Even ideas that seem to come right out of our head had their roots in something. For this card I was inspired by my purse. This was my trade card for our last demo meeting - we did an "inspiration trade". That means we need to try to make a card to match something: a bedspread, a rug, curtains, clothing, branches on a tree . . . something real that we can point to and say "I tried to make that". For my inspiration I chose the "drop dead gorgeous!" purse that we received at convention this summer. We always get a bag at convention and this one was my all-time favorite. 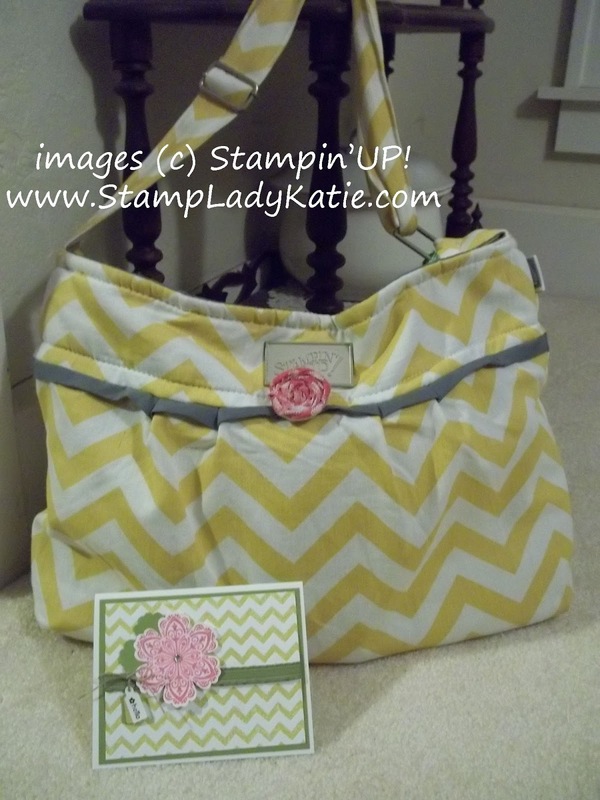 The chevron pattern of the fabric on the purse was easy to reproduce. 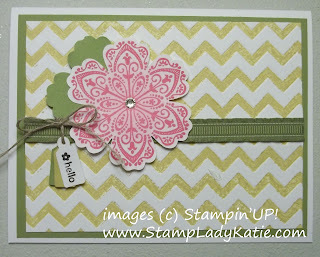 I used the Chevron Embossing Folder and brayered on some Summer Starfruit ink before I pressure embossed. That gave the texture and color pattern. 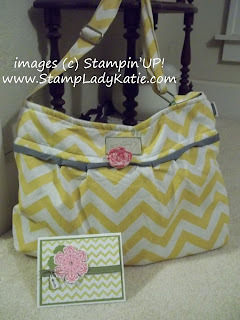 The band on the purse is gray but I used the Lucky Limeade Ruffled Ribbon. 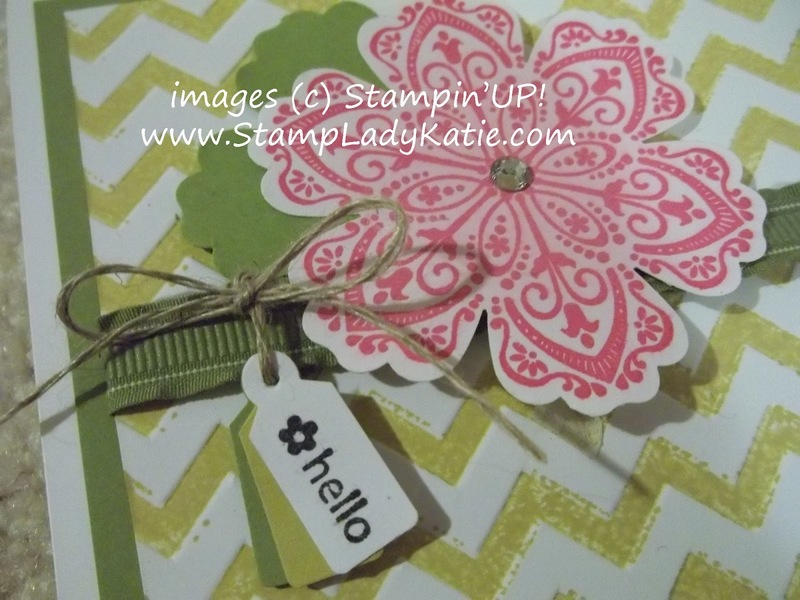 The little pink flower on my purse is actually not from Stampin'UP! Well, it kind of is, it just didn't come with the purse. We made it at one of our meetings from our Flirtatious fabric and a Jumbo Sticky Round. I thought it looked good on the purse. 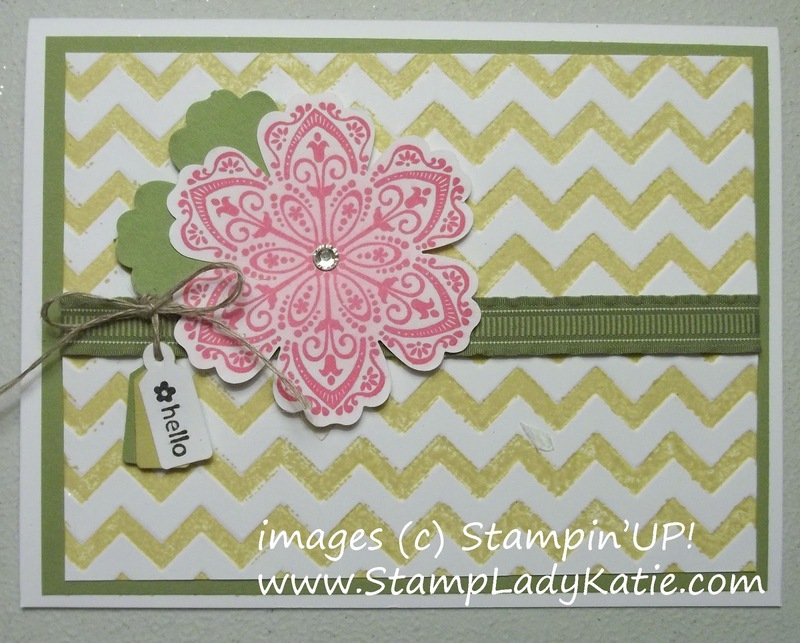 The pink flower on the card was stamped with Melon Mambo ink and a flower from the Mixed Bunch stamp set. The flower and leaves were punched with the matching Blossom Punch. 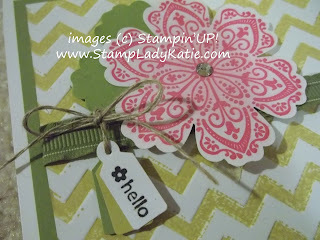 The little tags were punched with the Jewelry Tag punch and the image on the little tag is a stamp from the Tiny Tags stamp set. They were tied on the ribbon with a piece of Linen Thread. And - in the spirit of true high fashion - its finished off with a little "bling", a self-adhesive rhinestone in the middle of the flower. Would you not say this was inspired? So, where do you get your inspiration? I find that the more I stamp the more I find inspiration in everything around me. But I also enjoy going to events where the card is designed for me - I just like making cards. Need a little inspiration? Attend the November Stamp-a-Stack this weekend. We'll be making 10 fall themed cards. Check the events calendar for details. Bring your camera and come with a friend - share the fun.